On the last track we discussed risk factors of complicated mourning. I described six risk factors of complicated mourning. They are traumatic deaths, the caretaker is not functioning well, the child had a love-hate relationship with the deceased, the child experienced multiple losses, the deceased had an extensive illness, and the child has other mental health issues. On this track we will discuss the six signs of complicated mourning. The six signs of complicated mourning that we will discuss are continuous hyperactivity, ongoing and significant changes in performance, persistent regression, ongoing depression, self-destructive behavior and chronic anger. If, on the previous track, you identified a client with a risk factor of complicated mourning, you can use this information to determine if he or she has developed a pattern of complicated mourning. The first sign of complicated mourning is continuous hyperactivity. 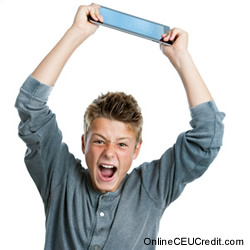 As you are well aware, children spend a great deal of their time in a hyperactive state. When I asked Davey’s parents to monitor him for continuous hyperactivity, his father Frank asked, "What’s the difference between hyperactive kids who need extra help and those that don’t." I stated, "When children are continuously hyperactive due to complicated mourning, they have a fear that is generalized. Nothing specific frightens these grieving kids, but instead everything frightens them." Think of your Davey. Is he continuously hyperactive due to generalized fear? Later on this track, we will discuss a technique to help children like Davey release their fear. The second sign of complicated mourning is ongoing and significant changes in performance. You already know that after a significant loss, parents may see their child’s grades slip or their athletic performance dip. These temporary changes in performance are typical of grieving children. But if the child experiences ongoing and significant changes in performance over an extended period of time, it may be a sign of complicated mourning. Would you also agree that a child’s social patterns can indicate possible complicated mourning? In addition to continuous hyperactivity and ongoing and significant changes in performance, the third sign of complicated mourning is persistent regression. As you have probably experienced, grieving children may display periods of regression. I experienced regression show up in 7 year old Jamie as bed wetting, thumb sucking, and an unwillingness to share. Jamie’s father Eric stated, "It seems like Jamie has reverted back to being three. She wets her bed a couple times each month and I catch her sucking her thumb sometimes." I stated to Eric, "Isolated incidents or temporary behaviors are generally not cause for concern. However, if Jamie engages in persistent regression, it may be a sign of complicated mourning." Have you treated a grieving child like Jamie who required evaluation to determine if she suffered from complicated mourning? Later we will discuss a technique. The fourth sign of complicated mourning is ongoing depression. As you are aware, feelings of depression often accompany grief at some point. The presence of symptoms of clinical depression, however, may indicate patterns of complicated mourning. In my practice, I inform parents of symptoms to watch out for. In addition to continuous hyperactivity, ongoing and significant changes in performance, persistent regression and ongoing depression, the fifth sign of complicated mourning is self-destructive behavior. Generally manifesting in teens and older children, self-destructive behavior can be an indicator of complicated mourning. I ask parents of grieving children to beware of activities such as substance use, sexual promiscuity, high-risk sports, reckless driving, and gang activity. Obviously, signs of suicidal tendencies must be immediately addressed. Would you agree that self-destructive behavior is a late sign of complicated mourning? The sixth sign of complicated mourning is chronic anger. As with the other signs of complicated mourning, anger is a common emotion during periods of grief. Clearly, chronic anger can indicate complicated mourning. Sarah, age 14 developed patterns of complicated mourning. Sarah’s mother, Renee noticed her chronic anger as an indication of complicated mourning. Renee stated, "Sarah is always so angry. In the weeks after her boyfriend died, it seemed normal. Now I’m starting to worry. It’s been three months and she lashes out constantly. The police have been to the school five times in the last two weeks because she gets so violent!" Think of your Sarah. Does she or he display open aggression due to complicated mourning? To help Sarah avoid open aggression and violent actions while she dealt with her grief, I used the "Let Go By Holding On" technique. If you are treating a client whose grief and complicated mourning has led to chronic anger, evaluate this technique to see if it may be helpful. 1. First, Sarah made a tight fist around a stress ball. 2. Second, Sarah kept her fist tight while counting to sixty seconds. 3. In addition to making a tight fist and counting to sixty, the third step in the "Let Go By Holding On" technique is to begin to increase the strength of the grip with each count beginning at forty seconds. 4. Fourth, I related the discomfort Sarah felt to the emotional pain associated with anger. 5. The fifth step required Sarah to continue to squeeze through her discomfort until she reached sixty seconds. After sixty seconds, Sarah slowly released her grip. Sarah stated, "It felt so good to finally let go. And I wasn’t angry anymore." Think of your Sarah. Could an anger management technique like the "Let Go By Holding On" technique help pave the way for constructive grief processing? On this track we have discussed the six signs of complicated mourning. The six signs of complicated mourning are continuous hyperactivity, ongoing and significant changes in performance, persistent regression, ongoing depression, self-destructive behavior and chronic anger. On the next track we will discuss suicide and murder. We will explore how to explain suicide, how suicide confuses children, and how to explain murder. What are the six signs of complicated mourning? To select and enter your answer go to CEU Answer Booklet.